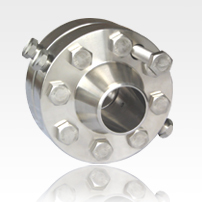 Orifice Flanges are widely used in conjunction with orifice meters for measuring the rate of flow of liquids and gases. They are basically the same as standard welding neck and slip-on flanges except for the provision of radial, tapped holes in the flange ring for meter connections and additional bolts to act as jack screws to facilitate separating the flanges for inspection or replacement of the orifice plate. In choosing the type of orifice flange, the considerations affecting the choice of welding neck and slip-on standard flanges apply with equal force.